Tim Ho Wan, the world's cheapest Michelin-starred restaurant, is already locked and loaded to open next month above the railway station in Chatswood. And it won't be the only new arrival pulling in at the overdue development. 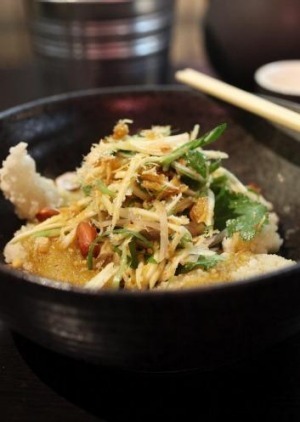 Chatswood restaurant Khao Pla is opening a new restaurant, Chum Tang, mid-March. The trainspotters at Giant Design look to have had their way with the design. While still in the building stage, the Thai restaurant's interior takes it lead from the rail world: the kitchen will reside in an area resembling a provincial Thai railway ticket office and the seating looks like something from a railway waiting room. Bangkok-born chef Taweerach Rojratanavichai, who has worked locally at Spice I Am and Mr Wong, will cook regional Thai dishes from a clay stove and charcoal grill. All aboard.